Boil the kettle and soak the noodles in the boiling water according to the packet instructions. Meanwhile, rub the beef with olive oil, sprinkle with the cumin and a small pinch of salt and rub all over. Place in a really hot frying pan and sear on all sides. Add the onion, ginger and chilli and cook for a couple of minutes, then add the mushrooms, stock and pak choi. Drain the noodles and add them to the pan. Stir around, and correct the seasoning. 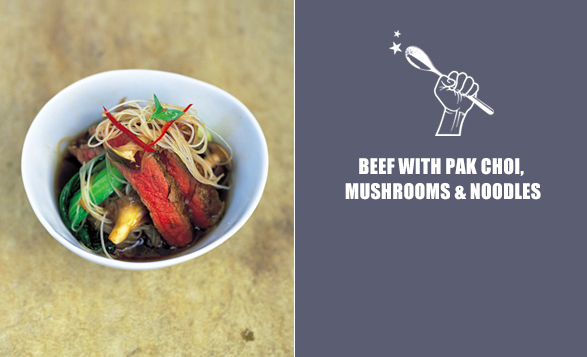 Slice up the beef and serve the noodles and pak choi in a big bowl, with the beef slices on top. Pour over the broth from the pan.